A hyperextended elbow is an injury that usually happens very quickly and without warning. It commonly happens to people who participate in contact sports like football. The pain the injury causes not only interferes with your ability to play sports, but it can also make everyday activities a challenge. Doctors have developed a series of treatments for hyperextended elbow that encourage recovery. A hyperextended elbow is a traumatic injury to your elbow. It happens when your arm is straightened involuntarily and with great force. With this injury, your elbow is extended beyond the normal range of its motion, which can cause a bruise on either the humerus or the olecranon along with damage to the surrounding soft tissue. These injuries lead to pain at the moment of injury as well as lingering pain when you try to move your elbow to the full extent of your normal range of motion. Doctors who work in sports medicine often see hyperextended elbows in athletes and have developed treatments for them. The first form of treatment for a hyperextended elbow, no matter how severe, is to stop the pain. Over-the-counter pain medication like acetaminophen or ibuprofen is usually all that is required. You can take them when the injury first occurs and then during recovery, as needed. If your elbow is swollen, icing the joint can help to both relieve the swelling and also numb the pain. 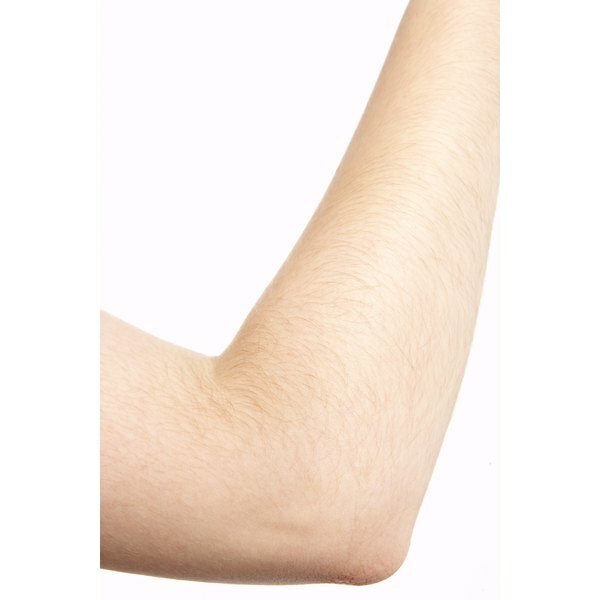 If you have a more severely hyperextended elbow, then you might experience considerable pain when you move your arm and flex your elbow, especially as you straighten the joint. If this is the case, then your doctor might suggest that you immobilize your arm by wearing a sling until the worst of the pain is gone. After you stop using the sling, you can continue the immobilization treatment with a hyperextension tape job, which will prevent your elbow from straightening to the point of causing pain. After the worst of the pain has faded, the next stage of treatment for a hyperextended elbow can begin. Your doctor can show you simple therapy to increase the range of motion you can get from your elbow without feeling pain. You can begin with gentle range-of-motion exercises in your arm. After successfully completing those exercises, you can begin doing resistance training using weights to build the strength in the muscles around your elbow. The simplest form of treatment for a hyperextended elbow is simply to give the joint time to heal. If you have a very mild injury, then you will not need a sling or therapy. The damage should be healed in a few days, and after this time you will be able to resume your usual activities with no lasting ill effects. More severe injuries will heal in three weeks to a month. Can I Run With Plantar Fasciitis?